Can the hideous Christmas sweater your Great Aunt Millie gave you top the ones on this list? Hot pink tinseled trees. Life-sized reindeer head. Light-up Santa doll with gold lame hat. The ultimate in tacky Christmas garb can be found in this collection of the most horrendous holiday sweaters in existence. 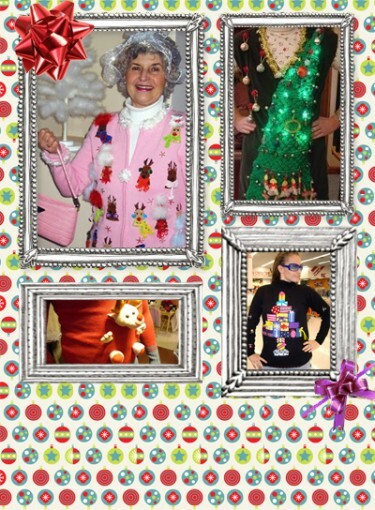 I trolled the Internet to find pictures of people wearing their holiday “best,” and saw more bedazzling and creative yarnwork than I ever thought possible. Check out the most ridiculous Christmas sweaters you’ve ever seen. You’ve probably seen a bad Christmas sweater or two in your day, and maybe even worn your own at an ugly holiday sweater party. But nothing, and I mean nothing, can prepare you for the ultimate in vulgar Christmas wear. I could try to describe it, but honestly, you wouldn’t believe me if I told you. You just have to see it for yourself. I will give you a hint though: One woman got very creative with her reproduction of Rudolph’s red nose. See it for yourself on slide 20. Trust me, it’s worth the wait. P.S. Want to share your own ugly Christmas sweater with us? Head over to our Facebook page, and post a picture of yourself wearing it on our wall. Bonus points if you can top any of these insane getups.